It's the Monday after... the Tour de France is now happily ended on the Champs-Élysées and for the past 3 weeks I had somewhere to be at 5 am. It's a sweet summer routine when I wake up to the early sun and my cell phone buzzes with a text that reads something along the lines of... "Tour's on, so is the coffee". I splash some cold water on my face and ride up to Gail's house to cheer George Hincapie and the rest of the peleton on. Watching Cav's slingshot sprinting, Contador's climbing acceleration and Fabian's absolutely divine legs (and beautiful smile) is a great way to start any day - but it is definitely my July 'habit.' But the Monday after is bittersweet - but not for long, there's so much work to do. Afterall, it's harvest time and the fruit is finally coming in! 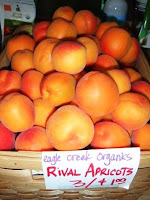 Eagle Creek Orchards started picking during Gold Miners Jubilee. I had such a blast off ering samples of fresh picked, local, organic PlumCots and Apricots on the sidewalk all day. We waited so long for the early fruit and now everything is coming all at once. Today, John Miller walked in with boxes of the juiciest Sweet Cherries you've ever tasted from his orchard in Cove. Lynn and I already ate too many cherries today, but we'll be offering samples all week and you wouldn't want to miss these beauties! started arriving! Mom and Mike got here on Thursday and I made Huckleberry S cones for breakfast! Then it seemed like the switch just turned on in my garden and suddenly I've got lettuces galore, baskets of arugula, gorgeous courgettes (the tasty, striped and slender french zucchini) and did somebody say they needed cilantro?? Needless to say, the garden (and other Baker County produce) was featured prominently in everything I cooked this weekend. I dry roasted a Sexton Beef Tri-Tip (so easy!! just 450 for 20 minutes after rubbing with herbs) and then thinly sliced the meat for arugula and roast beef sandwiches one afternoon and then arranged with fresh mozzarella (still from Italy, nobody is making mozz here YET!) over the greens from my garden, with quickly sauteed broccoli and garlic scapes with cured black olives and sunflower seeds. It was gorgeous and delicious as well. We also enjoyed an Abeja Chardonnay that evening, I still think they make the very best Chardonnay in America! Super Big, super rich, super silky, aromatic and lush with layers of complexity and it's from Walla Walla- what more could you want?!?! And I'd just smile and say WEDNESDAY!!! The early peaches will be here this week, Linda called from the Orchard this morning to say they had just picked 700 pounds of sweet organic peaches. I'm already dreaming about the Rosa peaches, my personal favorite!